Reserving a table for two on February 14th can be a stressful task. 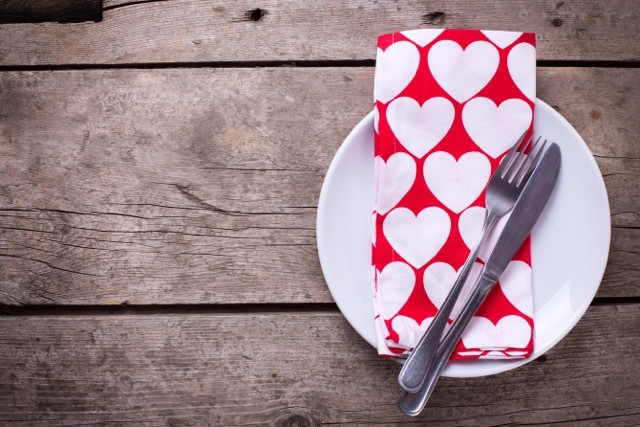 Prix fixe menus, last minute reservations and inconvenient seating times all make eating out a somewhat unromantic affair. This Valentine’s Day, we’re proposing staying in, cooking together and going on a culinary adventure with your loved one in your very own kitchen. With plenty of delectable main course options on our weekly menu including Linguine with kale, walnuts and romano cheese and Spiced pork and winter hash, we’ve taken care of the hard part. And while we prepare the ingredients for you, you can go shopping for the perfect gift. Get connected: When just the two of you are in the kitchen (without waiters and other diners around) you have the opportunity to truly connect. Cook and chat to catch up on your day, future goals or just reminisce about how you spent last Valentine’s Day together. Learn new things: Do your partner’s eyes tear endlessly while chopping onions? Does he or she have amazing knife skills that you never knew existed? Spend an hour in the kitchen and you may discover something new about each other, while also learning new skills together. Stimulate your senses: Cooking alongside your partner allows you to awaken your senses. The vibrant colours of your fresh ingredients, the aroma of savoury spices, the sizzle of the skillet…. Taste the sumptuous meal you have prepared together and experience the sense of accomplishment. The dinner dance: Something magical happens in the kitchen when two chefs are working in tandem. Get in sync as you dance through the steps to create your meal. We recommend taking a few extra steps to set the mood for a romantic dinner for two. Take out your best dishes and silverware, light some candles and uncork a great bottle of wine. Hit play on your favourite slow jam playlist and savour each bite as you enjoy a delicious meal in each other’s company… And don’t worry about the dishes – they can wait until tomorrow.